Optimal für Linkshänder oder Linksanschlag ! Short Throw Safety Selector shortens the throw distance to 45o instead of 90o. This short throw distance allows for a rapid transition from “Safe” to “Fire”. 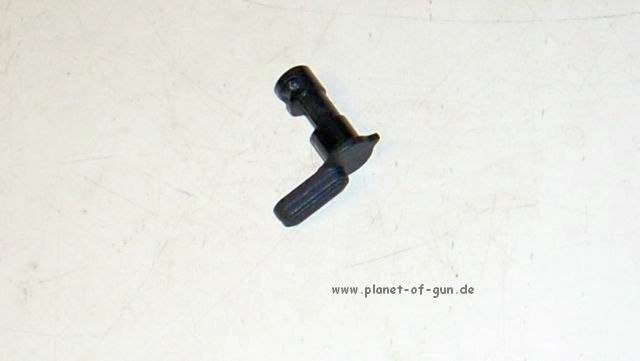 The Short Throw Safety Selector can only be used in 45o compatible lower receivers. Available with a Matte Black finish. 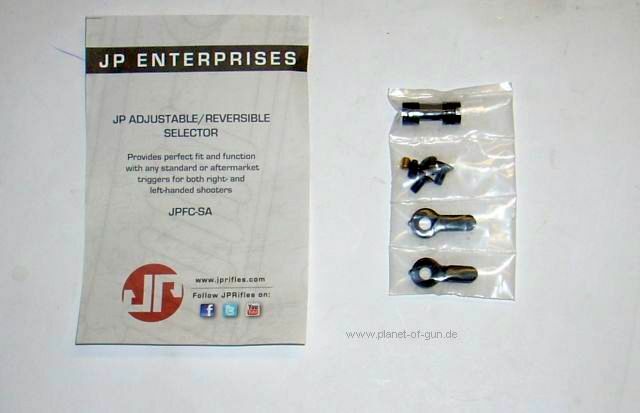 Easy-to-install, reversible safety selector ensures ultra-reliable engagement and eliminates the time-consuming job of “fitting the safety” to a factory or aftermarket trigger—the perfect upgrade to accompany a J.P. Enterprises Adjustable Trigger. Eliminates the risk of damaging the trigger during fitting and shortens installation time by as much as one-third. 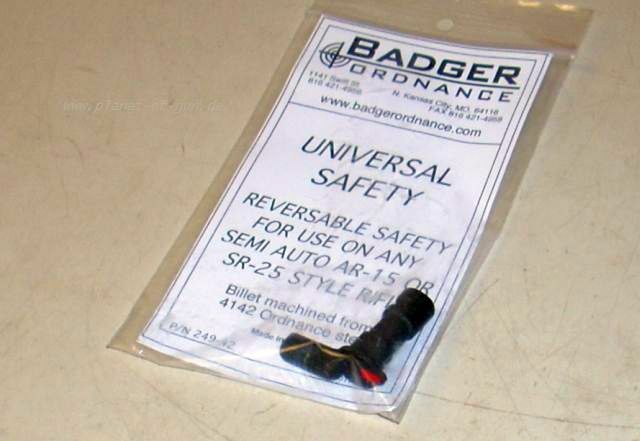 An adjustment screw on the selector drum lets you quickly and easily set the correct trigger/safety relationship to completely block trigger movement when the selector is set to “safe.” A second screw inside the drum ensures the adjustment screw stays locked in place. Deeply grooved control pad gives positive thumb engagement even when wearing gloves, and can be installed in the standard position on the left-side of the receiver or on the right side for fast, natural operation by left-handed shooters. Includes a low-profile ambidextrous lever for the other side that adds minimal bulk while giving you the flexibility to operate the safety with the off hand in an emergency or if the strong hand is injured. Or add the JPFC-SL1 Ambidextrous Selector Lever to give your rifle a full-size safety lever on both sides of the receiver for fully ambidextrous operation. Ideal for tactical and competition shooters who may need to operate the selector with the weak hand to accommodate an unconventional shooting position. All-steel selector lever installs like the original and adds a lever to the right side of the gun for left-handed shooters or right-handed shooters shooting from unorthodox positions. 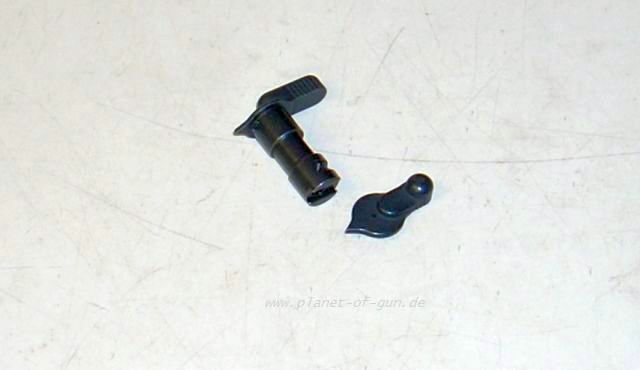 Right-side lever has a low profile to avoid interfering with the trigger finger of right-handed shooters and is retained with a detent - no screws or pins to work loose. 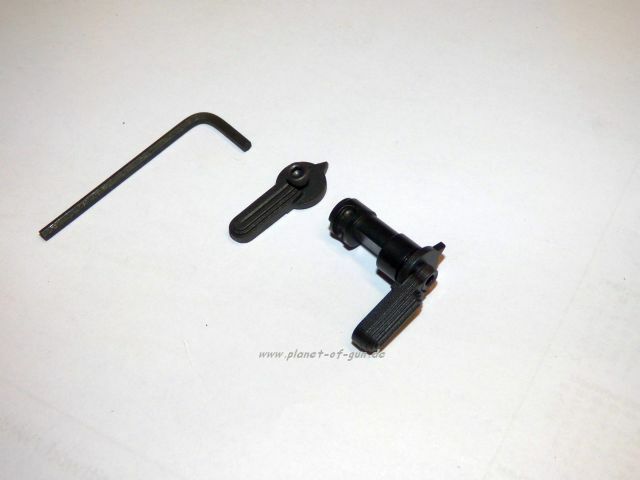 Small and large lever can be reversed and used on either side. Made of tool steel to last a lifetime. SPECS: Hardened tool steel, matte black oxide finish. 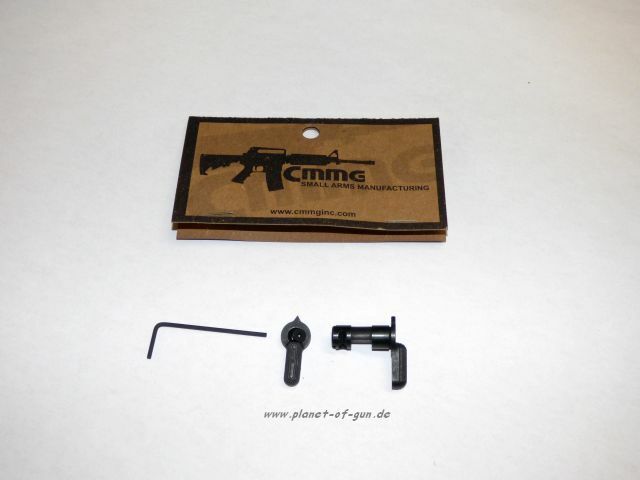 Fits semi-auto AR-15s with mil-spec lower receiver. 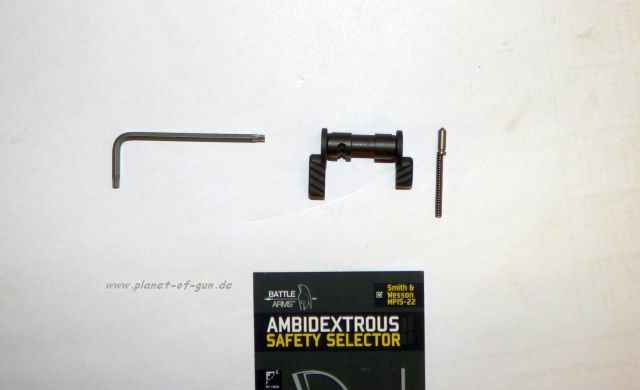 Safety selector drops in to standard AR-15 and DPMS-pattern .308 lower receivers to give ambidextrous function. Opposite-side lever secures with set screw ad can be easily installed or removed. Ridges give positive purchase for fast operation. SPECS: Fits - AR15 and LR-308 lower receivers (308 fits DPMS pattern lower receivers). 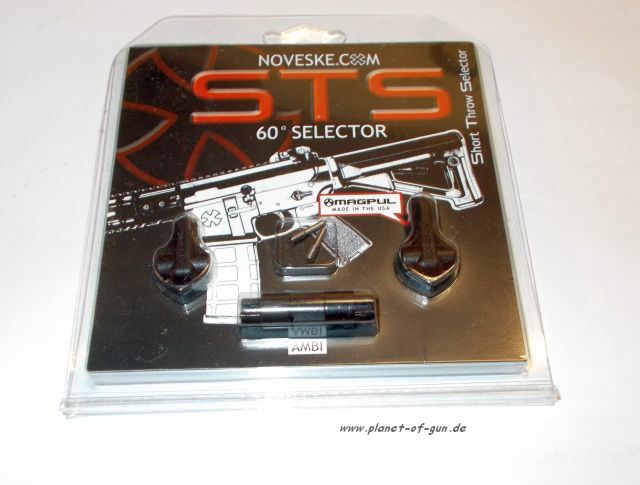 Noveske’s STS (Short Throw Selector) gives your AR’s selector a short 60° throw for fast, easy transition between the “Fire” and “Safe” positions. It uses Magpul’s popular SSG selector lever (included) for the FN SCAR for enhanced ergonomic feel, and is available in both standard right-hand and ambidextrous versions. For further versatility, the Noveske kit includes both long and short levers to help you get the best feel and function. The central shaft is machined from hardened stainless steel with a nitride coating for surface wear resistance. 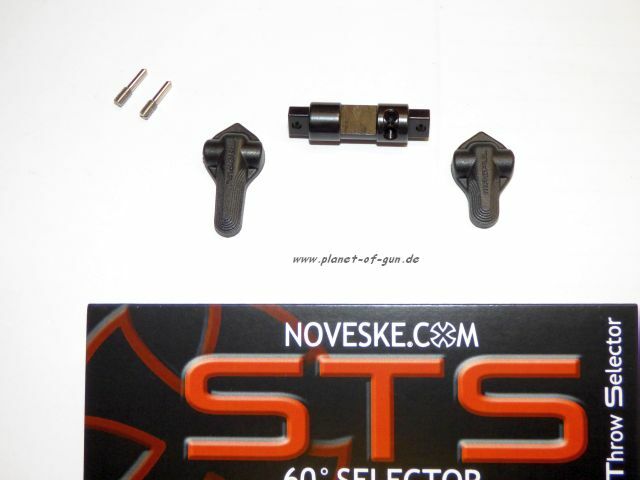 SPECS: Selector shaft - Stainless steel, hard nitride finish, matte black. 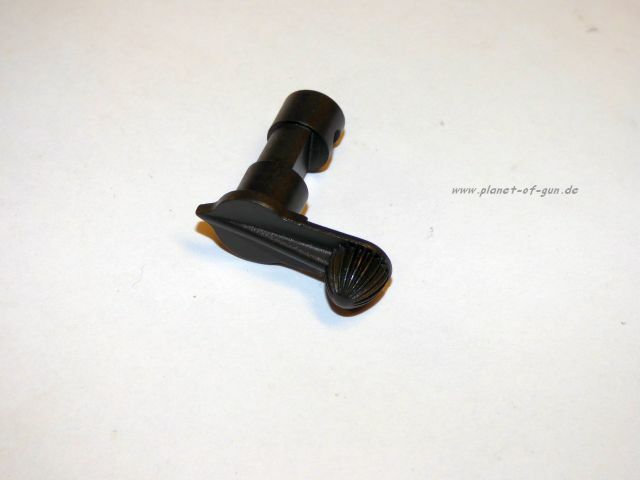 Levers – molded polymer, matte black. 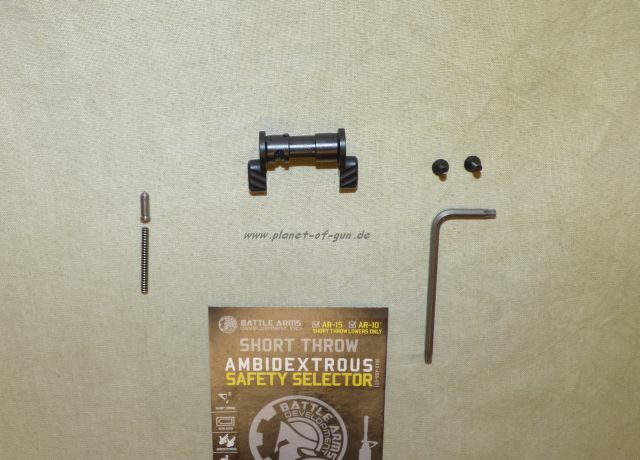 The Universal Safety Selector can be installed in either a right or left hand configuration, preventing selector obstructor for the left handed shooter. 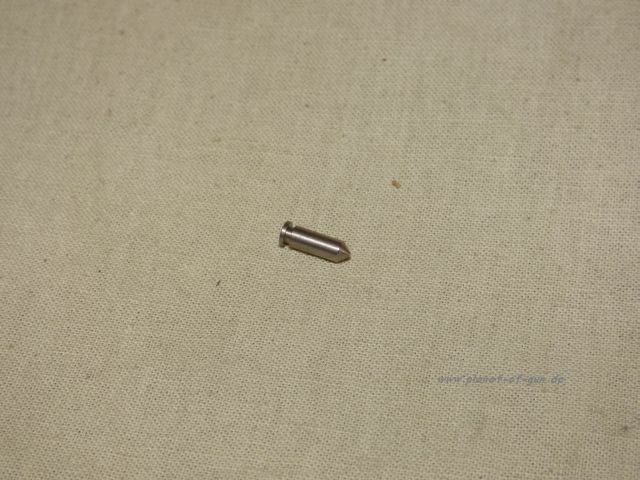 Machined from billet 4140 hardened steel and Mil Spec parkerized finish. Round thumb pad gives fast, positive operation; especially important when wearing gloves. Rolls easily under your thumb for faster application or release. SPECS: 4140 steel, black, matte finish. 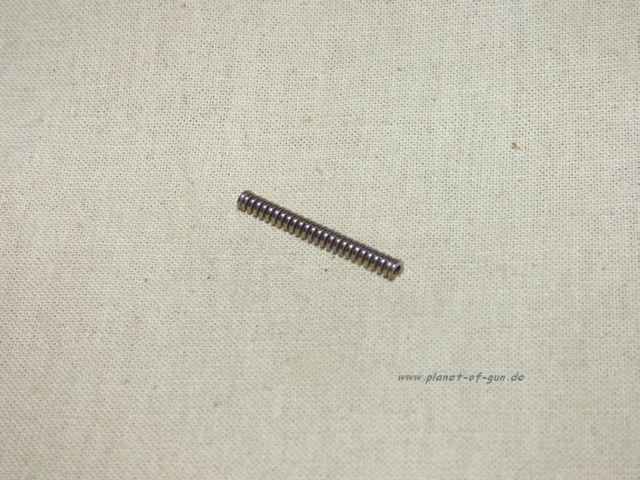 For semi-auto AR-15 only.